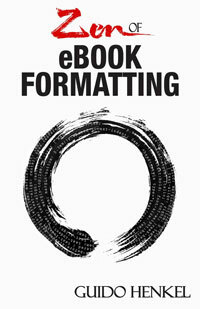 Been following your advice on creating an ebook. Got stuck so I bought Zen–figured I owed you the books price for the information you’ve already provided me, anyhow. The book is definitely worth it but I still haven’t solved my problem. My images will not resize for Kindle. I created a css img.logo and set the height:3em; followed your instructions “span class=”centered”> (just retyped that so it might have an error here, but I’ve double-checked from Zen to my html.) I convert the file using Calibre to MOBI and open it in the newest version of Kindle for the PC. The image, (small 8kb) remains the same size when I change the font size. I’ve gotten everything else to work–the book is ready to go if I could fix this one problem. Been working on it for three days. I know I’m missing something. Any suggestions would be appreciated. Rats! My coding got erased in the previous post: Thanks! That’s the only real typesetting error here – repetition. This simply is not a case where nonbreaking space is needed. Neither is 1964 Mustang or 1953 Corvette. Further, check if Corvettes were actually manufactured in 1953. All incorrect. There is no call for nonbreaking space. The New Yorker might write that, but in the ordinary course of events all numbers above ten are written in digits. I could give you a nice list of exceptions, but “thirty days” is not one of them. Also, “eBook” is a bizarre way to write “E-book” or “ebook” (cf. eBusiness), and you aren’t consistent about it. You are completely missing the point of my post. It is entirely irrelevant if there is a repetition in the example, whether a 1953 Corvette exists or not, or whether you write digits as numerals or words, because these examples are for illustrative purposes only, and a lot of it is defined by what the author wrote in the manuscript. As for the other cases, you are applying print typography rules to eBooks, which do not work because the game has changed with eBook devices. The whole purpose of the post is centering around the issue that eBook devices do not follow typographic rules and that they need some nudging to create the impression of correctness and a pleasing appearance. Surely you are not advocating that “Mr. Holmes” should be broken apart, so the software needs help. Of course, normally you would not insert a non-breaking space in some of these places I mention, but for eBooks you will have to if you want to avoid certain issues.